SUBMIT your news to TDmonthly. See previous toy industry news. ASTRA Announces 2011 Best Toys For Kids Winners. June 30, 2011 — ASTRA has announced their 2011 Best Toys for Kids list. The 22 products chosen were selected for their high quality and play value. The list included toys from Corolle, Manhattan Toy, Hape, Playmobil, The Orb Factory, Klutz, Blue Orange, PasMart, and more. You can see the full list here. Uniqlo to Unveil Harry Potter Apparel. June 30, 2011 — Warner Bros. Consumer Products partnered with Uniqlo, the largest clothing retailer in Japan, for a Harry Potter apparel line. Toy Industry Foundation and Boys & Girls Clubs of America Celebrate the Year of the Coast Guard. June 30, 2011 — In recognition of the Year of the Coast Guard Family, representatives from the Toy Industry Foundation (TIF) and Boys & Girls Clubs of America (BGCA) distributed new toys and games to 250 children stationed at the Massachusetts Military Reservation, Cape Cod, MA and surrounding military installations. BJ's Wholesale Club to be Acquired. June 30, 2011 — BJ's Wholesale Club will be acquired by Leonard Green & Partners and CVC Capital Partners in an all-cash transaction valued at $2.8 billion. BJ's, which operates 190 warehouse clubs in 15 states, reported $10.6 billion in sales last year. China to remain world's toymaker despite costs. June 30, 2011 — The chief executive officers of Hasbro Inc (HAS.O), LeapFrog Enterprises (LF.N) and Toys R Us Inc TOY.UL all told the Reuters Global Consumer and Retail Summit this week that China's considerable advantages as a manufacturing mecca mean it will remain toymaking's main hub. Retailers twice shy about holiday season. June 30, 2011 — Retailers, bitten by over-optimism last holiday season, are planning conservatively for the coming season in order to limit profit-sapping discounts on unsold merchandise come January. Swing Sets Recalled by Adventure Playsets due to Fall Hazard. June 30, 2011 — The U.S. Consumer Product Safety Commission, in cooperation with the firm named below, today announced a voluntary recall of the following consumer product: approximately 240,000 Adventure Playsets Wooden Swing Sets, sold at Academy Sports (the Yukon); Mills and Menards (the Ventura/II) all from 2005 to 2007; Mills (the Belmont) in 2004; Toys-R-Us (the Bellevue/II); and Walmart (the Tacoma/II, Durango/II, and Sedona). The units sold for $300-$600. The wood in the posts of the fort sections on the swing sets can weaken due to rotting, posing a fall hazard. Consumers should immediately stop using the recalled swing sets and contact Adventure Playsets to obtain a free repair kit. Cost Plus Inc. 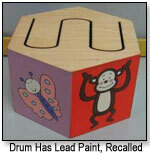 Recalls Wooden Animal Drum Due to Violation of Lead Paint Standard. June 30, 2011 — The U.S. Consumer Product Safety Commission, in cooperation with the firm named below, today announced a voluntary recall of the following consumer product: About 1,000 Wooden animal drums from Cost Plus Inc., sold at Cost Plus World Market stores nationwide from December 2010 through May 2011 for about $7. The paint used on the drum is in excess of the maximum allowable level of 90 ppm, a violation of the federal lead paint standard. Consumers should immediately stop using the toy and return it to Cost Plus World Market for a full refund. Fox Names 'Family Guy' Toy Partner. June 29, 2011 — Twentieth Century Fox Consumer Products has signed Playmates Toys to make a toy line for "Family Guy." The first products, the Family Guy Crazy Interactive World play set and figures, will hit stores this fall. LeapFrog Unveils Tablet Computer for Children. June 29, 2011 — All parents who own an iPad know this: Their kids want to play with the iPad as much as they do, and that means they have to share. Now LeapFrog, the educational toy maker, may provide some relief. The company on Tuesday unveiled a $100 tablet computer that is designed specifically for children. Toys R Us to Work More With EBay. June 29, 2011 — Toys R Us Inc, the world's largest toy retailer, plans to work more with EBay Inc following the e-commerce company's recent acquisition of GSI Commerce, Toys R Us Chief Executive Jerry Storch said on Tuesday. Toy-Maker Needs New Shipping Game Plan. June 29, 2011 — The PlasmaCar, a quirky ride-on toy car, has become one popular way for kids to get around. But while Tim Kimber, chief executive officer of Ottawa-based PlaSmart Inc., distributor of the PlasmaCar, may offer easy transportation for toddlers, getting his products from one destination to another is proving much more difficult. Unsure About Home, Hasbro Looks Abroad. June 29, 2011 — The company sees 60 percent of its revenue coming from outside the United States in the medium to long term, its chief executive said told Reuters on Tuesday. Safer Cribs for Babies Available Starting Today. June 29, 2011 — On December 15, 2010, the U.S. Consumer Product Safety Commission (CPSC) voted unanimously to approve new mandatory crib standards, establishing the most stringent crib safety standards in the world. Starting today, all importers, distributors, manufacturers, and retailers must offer only cribs that meet the CPSC's new and improved full-size and non-full-size crib standards. Papercutz, Lego To Launch Ninjago Graphic Novels. June 29, 2011 — Blazing Lego ninja action will come to kids' graphic novel imprint Papercutz this fall, with the publication of the first in a series of Ninjago graphic novels. Ninjago is a line of Lego products featuring ninjas who practice the martial art of Spinjitzu, a tradition found only in the Lego world. MGA Taps Activision for Lalaloopsy. June 29, 2011 — MGA has granted Activision Publishing exclusive worldwide rights to develop, manufacture and distribute video games based on the Lalaloopsy brand and characters. Disney Debuts “Shake It Up” Merchandise Line For Tweens. June 29, 2011 — Disney Consumer Products today announced the first merchandising program inspired by Disney Channel’s series Shake It Up. The new merchandise program for tweens plays up the characters’ dancing lifestyle and features collaborations with Mattel and fashion collections at Target, K-Mart, Sears, Payless, JCPenney, Kohl’s, and Macy’s. The new products will begin arriving in stores this August through the holiday season. Women Account For Bulk Of Spending In Juvenile Products Market. June 28, 2011 — Women are the majority spenders in the juvenile products market, accounting for 77 percent of total dollars spent, while nearly half of all dollars spent come from parents buying for their own children, according to Juvenile Products Market Overview, the latest report from The NPD Group. Hasbro Unveils TF3 Crew Apparel. June 28, 2011 — Hasbro unveiled its TF3 Crew series, a “behind-the-scenes” apparel and accessories collection inspired by the gear worn on the set of Transformers: Dark of the Moon. TRU Adds Hawaiian Toy Story Line. June 28, 2011 — Toys 'R' Us launched an exclusive line of Toy Story: Hawaiian Vacation toys to support Disney-Pixar's Toy Story: Hawaiian Vacation, an animated short playing in theaters in conjunction with Cars 2. Qwirkle, 7 Wonders Win Spiele des Jahres 2011. June 28, 2011 — Qwirkle, designed by Susan McKinley Ross and published in Germany by Schmidt Spiele, has won board gaming’s most prestigious prize, Speiele des Jahres (German game of the year). 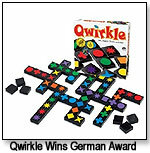 Qwirkle was published in the US a few years back, already, but in Germany only last year. 'Brave' Trailer Teases Lush, Epic Animated Adventure. June 28, 2011 — A trailer for Pixar's next animated film, "Brave," was finally released online today after being imprisoned in theaters as a preview that displayed before "Cars 2." Mattel: Making A Move, Up 0.8%. June 28, 2011 — Mattel is one of today's notable stocks on the rise, up 0.8% to $26.96. SmarTrend currently has shares of Mattel in an Uptrend and issued the Uptrend alert on February 07, 2011 at $25.22. The stock has risen 6.1% since the Uptrend alert was issued. LBYR Inks Pact with Disney for Muppets Line . June 28, 2011 — Little, Brown Books for Young Readers has signed an agreement to release a number of titles, in different formats, featuring the Muppets. The agreement comes in anticipation of Disney's forthcoming movie The Muppets, which hits theaters in late November. First Amendment Trumps California in Supreme Court Battle Over Violent Video Games. June 27, 2011 — The Supreme Court sided with the video game industry today, declaring a victor in the six-year legal match between the industry and the California lawmakers who wanted to make it a crime for anyone in the state to sell extremely violent games to kids. Court: Why the First Amendment Protects Violent Video Games. June 27, 2011 — The U.S. Supreme Court today ruled that states cannot restrict the sale or rental of video games to minors, a decision that reinforces both the First Amendment protection for interactive games and the free expression rights of children. Michael Ziegenhagen of Playmatters is New Chair of ASTRA's Board of Directors. June 27, 2011 — Members of the American Specialty Toy Retailing Association (ASTRA) welcomed Michael Ziegenhagen, owner of the Cleveland, Ohio-area Playmatters toy stores, as the new Chair of ASTRA’s Board of Directors. Andy Cannon, owner of Discovery Depot in Cookeville, Tennessee, was designated Chair-elect by the membership. Elected as "Manufacturer Directors at Large" were Lea Culliton, President of HABA USA, and Ted McGuire, President of Thames & Kosmos, according to a press release. ABC Kids Expo Partners with International Freight Company for 2011 Show. June 27, 2011 — ABC Kids Expo 2011 has chosen Global Freight as their official partner for international freight shipments. Domestic freight for the show is being handled by Fern Exposition & Event Services, according to a press release. Vornado's Toys R Us Loss Widens. June 27, 2011 — Vornado Realty Trust on Friday said its quarterly loss related to its share in toy chain Toys R Us widened as the retailer invests in opening new stores and updating its technology. Kids' Apparel Dominates. June 24, 2011 — According to the latest results from The NPD Group's Kids Industry Data Service (KIDS) report, the categories that captured the most dollar share for kids over December 2010-February 2011 time period were apparel/accessories with 17 percent, toys/board games with 14 percent and video games/PC game software and video game system hardware, which both captured 10 percent respectively. Hasbro's New Brand Man. June 24, 2011 — As Hasbro continues its rollout of major initiatives focusing on the company's branded play profile, instrumental to its strategy is the new role Joe Keane will execute as vice president, brand licensing for the Americas. Little Charley Bear Gets an App. June 24, 2011 — Chapman Entertainment has launched an official Little Charley Bear mobile app called Match and Play, available today. Mattel to Webcast Second Quarter 2011 Earnings Conference Call. June 24, 2011 — Mattel, Inc. (NASDAQ: MAT) today announced that it will webcast its quarterly conference call on Friday, July 15, 2011 at 8:30 a.m. Eastern time. Led by the company's chairman and chief executive officer, Robert A. Eckert, the conference call will cover the company's second quarter 2011 financial results, which will be released prior to the call. Toddlers Know Why Toys Don't Work, Researchers Report. June 24, 2011 — Infants are attracted to toys by color, shape, size, texture or the sounds they make. Authors of a MIT study published in the journal Science found that children as young as 16 months seem to be able to figure out whether a toy does not work as it should because something is wrong with the toy or because of the way they're playing with it. GAMMA Sports Recalls Children's Tennis Racquets Due to Risk of Lead Exposure. June 24, 2011 — The following product safety recall was voluntarily conducted by the firm in cooperation with the CPSC: About 2,000 Quick Kids Junior Tennis Racquets from GAMMA Sports, sold online at www.gammasports.com, www.atssports.com and www.holabirdsports.com from December 2010 through March 2011 for about $15. he orange grip tape on the tennis racket's handle contains high levels of lead. Consumers should immediately take the recalled tennis racquets away from children and contact GAMMA Sports for a free replacement grip kit. The World's Top 100 Most Valuable Brands. June 24, 2011 — The 2011 BrandZ report on the Top 100 most valuable brands showed clearly the importance of brand recognition as companies worked to overcome the economic challenges of 2009. Mattel Takes Power of Play to Special Olympics World Games with Largest Global Team of Corporate Volunteers. June 24, 2011 — Mattel, Inc. today announced that 50 employee volunteers from around the world will serve as Team Mattel at the 2011 Special Olympics World Games in Athens, Greece. S&S Announces New Dork Diaries Books. June 24, 2011 — On the heels of the recent release of Rachel Renée Russell’s Dork Diaries 3: Tales from a Not-So-Talented Pop Star, Simon & Schuster’s Aladdin imprint has announced details about the publication of the fifth and sixth books in the series in summer 2013 and 2014. Rugby Children's Pain & Fever Concentrated Drops Recalled Due To Failure to Meet Child-Resistant Closure Requirement. June 24, 2011 — The U.S. Consumer Product Safety Commission, in cooperation with the firm named below, today announced a voluntary recall of the following consumer product: About 898,000 Children's Pain & Fever Concentrated Drops by Altaire Pharmaceuticals, Inc., sold at drug stores, grocery stores and other retailers nationwide between January 2009 and June 2011 for about $4. This over the counter medicine contains acetaminophen which calls for child-resistant packaging as required by the Poison Prevention Packaging Act. Although the original bottle has child-resistant packaging, a separate dropper unit provided for dispensing the drug to children does not. Consumers should immediately store this product with the child-resistant closure in place and keep it out of the reach of children. Analysis: Christmas Gloom for China Toymakers as Orders Shrivel. June 23, 2011 — Many Chinese toymakers have seen a 5-10 percent fall in pre-orders for the 2011 holiday season. Jury Finds For Mattel In Board Game Ad Dispute. June 23, 2011 — A California state court jury on Monday found toy giant Mattel Inc. abided by a licensing contract when it spent nearly $2 million to advertise the board game Outburst: The Game of Verbal Explosions. Target Recalls Infant Girls Sandals Due to Choking Hazard. June 23, 2011 — The U.S. Consumer Product Safety Commission, in cooperation with the firm named below, today announced a voluntary recall of the following consumer product: About 51,700 Circo Aloma Infant Girls Sandals from Target, sold at Target stores and Target.com nationwide from January 2011 to May 2011 for about $10. The decorative plastic flowers can detach, posing a choking hazard. Britax Recalls B-Nimble Strollers Due to Risk of Brake Failure. June 23, 2011 — The U.S. Consumer Product Safety Commission and Health Canada, in cooperation with the firm named below, today announced a voluntary recall of the following consumer product: About 20,000 in the United States (800 in Canada) B-Nimble Strollers from Britax Child Safety Inc., sold at juvenile product and mass merchandise stores nationwide and online retailers between September 2010 and June 2011 for about $200. An audible click heard when the brake pedal is pressed can give a false impression that the brake is fully engaged when it is not. When the brake is not engaged, the stroller can move unexpectedly posing a risk of injury to the child occupant. Consumers should immediately stop using their strollers and contact Britax for information and to request an improved replacement stroller. Cartoon Network Enterprises and Jazwares Create Toy Line Based on Adventure Time with Finn & Jake. June 23, 2011 — Cartoon Network Enterprises (CNE) today announced a partnership with Jazwares to create a full line of toys based on the characters from the series "Adventure Time with Finn & Jake," including Jake the dog, Finn the human, Princess Bubblegum, The Ice King and many others. The line will be available at Toys“R”Us retailers in the U.S. and Canada starting this fall. ASTRA’s Marketplace & Academy Is Another Record Breaker. June 22, 2011 — ASTRA’s Marketplace & Academy, currently in progress in Anaheim, California, has posted a record number of attendees, the American Specialty Toy Retailing Association announced in a press release today. While final counts will not be available until Marketplace & Academy is over, early indications are that this year’s crowd was 20% to 30% bigger than last year. Next year’s ASTRA Marketplace & Academy—its 20th—will be held during June 2012 in Baltimore, Maryland. Flambeau Hires New Sales & Marketing Vice President For Their Retail Markets Group. June 22, 2011 — David Faulkner has joined Flambeau, Inc. as its Vice President of Sales & Marketing for its Retail Markets Group, which includes ArtBin art material and craft storage products and Duncan yo-yos and skill toys, according to a press release. Manhattan Toy Launches EDTOY. June 22, 2011 — Manhattan Toy is excited to announce its partnership with EDTOY as the exclusive, North American distributor. The initial collection is comprised of wooden toys that feature rotating magnest to connect their elements. Retail Container Traffic Close to Flat through July. June 22, 2011 — Import cargo volume at the nation’s major retail container ports is expected to remain at about the same levels as last year through July before starting to resume increases later this summer, according to the monthly Global Port Tracker report released today by the National Retail Federation and Hackett Associates. Christmas Tree Shops Recall Animated Safari and Aquarium Lamps Due to Fire and Shock Hazards. June 21, 2011 — The U.S. Consumer Product Safety Commission, in cooperation with the firm named below, today announced a voluntary recall of the following consumer product: About 35,000 Animated Safari and Aquarium Lamps from Nantucket Distributing Co. Inc., sold at Christmas Tree Shops stores primarily in the New England, Mid-Atlantic and Midwest regions from December 2009 through May 2011 for between $7 and $8. Defective wiring in the lamps can cause an electrical short, posing fire and shock hazards to consumers. Consumers should immediately stop using the recalled lamps and return them to Christmas Tree Shops store for a full refund. Chipmunks Franchise Increases Merchandising Program. June 21, 2011 — Leading up to the holiday release of Alvin and the Chipmunks: Chipwrecked!, Fox Consumer Products and Bagdasarian Productions have enlisted a wide range of partners to fuel an increased merchandising program for the Chipmunks franchise. Jack in the Box Removes Toys From Kids’ Meals. June 21, 2011 — Fast food chain Jack in the Box Inc. has taken out toys from its kids’ meals and is adding healthier options such as apple bites to its children’s menu. World Toy Sales In 2010 Were $83.3 Billion, An Increase Of Nearly 5 Percent Over 2009. June 20, 2011 — According to Global Toy Market Estimates: 2011 Edition, the most recent report from The NPD Group, global toy sales grew by nearly 5% (4.7%) in 2010 to $83.3 billion USD. While the growth was driven by strong performance in the Asia region, which increased at a rate nearly double the average (9.2%), the U.S. market remains the largest market with sales of nearly $22 billion, followed by Japan, China, United Kingdom and France. Liv Dolls Featured in Happy Meals. June 20, 2011 — Following last month’s successful Zoobles Happy Meal Campaign, Spin Master, Ltd. has once again teamed up with McDonald’s to present the Liv Happy Meal Campaign, running now through July 7. JAKKS Pacific's Tollytots Division and Dorel Juvenile Group to Bring Safety 1st Brand to the Toy Aisle. June 20, 2011 — JAKKS Pacific's Tollytots division has signed a worldwide master toy license with Dorel Juvenile Group, Inc., a division of Dorel Industries and the nation's largest juvenile products manufacturer, for Safety 1st. The Canadian Toy Association (CTA) supports the government's initiative to update its product safety legislation. The Canada Consumer Product Safety Act (CCPSA) is a positive step for Health Canada in aligning its product safety regime with other leading international regimes, according to a press release. "The toy industry welcomes the CCPSA," commented Jeff Hurst, CTA Chairman. "This Act introduces a number of important provisions, including mandatory recall powers. These provisions complement the rigorous testing and product compliance systems currently in place for toy manufactures." Paramount, Weta Partner for Tintin. June 20, 2011 — Paramount Licensing and and Weta Workshop, the five-time Oscar-winning conceptual and design facility, unveiled the first in a series of collectible sculptures from the movie studio’s forthcoming film release, The Adventures of Tintin, set to release internationally Oct. 26 and in the U.S. Dec. 23. Disney·Pixar's Cars 2 Rolls into Target. June 20, 2011 — Target has unveiled its new line of merchandise inspired by Cars 2. Green Lantern and Mattel: Friends with Benefits. June 20, 2011 — What does Mattel know about the movie business? More than you might think. Toy companies are so intertwined with the Hollywood creative process these days that studios often bring in big names like Mattel for feedback early in the development process of big blockbuster films. Toy Security Wand Lets Kids Emulate TSA Agents. June 17, 2011 — Wild Planet's "Spy Gear : Security Scanner" is creating controversy after a Toys"R'Us shopper tipped off The Consumerist, an online consumer empowerment/entertainment blog. NBCUniversal Inks Books Deals. June 17, 2011 — NBCUniversal Television Consumer Products Group inked book deals for its television properties with Hyperion Books and Penguin Group. Nick Taps D3 for 'Victorious' Game. June 17, 2011 — D3Publisher signed a worldwide publishing agreement with Nickelodeon for video games based on “Victorious,” Nickelodeon’s hit live-action comedy series. Legendary Driving For Hot Wheels Pic. June 17, 2011 — Interest in a Hot Wheels movie is revving up again, with Legendary Entertainment in early negotiations with Mattel to acquire film rights to the popular toy car line. Toy Show Opens At Tokyo Big Sight. June 17, 2011 — More than 35,000 toys from 139 companies are now on display at the 50th annual International Tokyo Toy Show at Tokyo Big Sight, which is open to the public on Saturday and Sunday. Child’s Entrapment Death Prompts Big Lots Recall of Metal Futon Bunk Beds. June 17, 2011 — In cooperation with the U.S. Consumer Product Safety Commission (CPSC), Big Lots is voluntarily recalling about 30,000 metal futon bunk beds, sold exclusively by Big Lots stores nationwide from January 2009 through April 2010 for about $200. Children behind the futon or in the ladder area of the bunk bed can get entrapped when the futon and its metal frame are lowered from the seated to the flat position. Consumers should immediately stop using these bunk beds and contact Big Lots for a free repair kit that contains new ladders and other parts that consumers can install at home. Emma's Garden Polka-Dot Girls' Dresses Recalled by TJX Due to Choking Hazard. June 17, 2011 — The U.S. Consumer Product Safety Commission and Health Canada, in cooperation with the firm named below, today announced a voluntary recall of the following consumer product: About 21,000 in the U.S. (2,600 in Canada) Emma's Garden® Polka-Dot girls' dresses from The TJX Companies, Inc.. T.J. Maxx sold the pink and white design and Marshalls sold the black and white design in the United States from February 2011 through May 2011 for about $13. Winners stores sold both designs in Canada, from March 2011 through April 2011 for about $17. The decorative buttons on the front of the dress can detach, posing a choking hazard. Consumers should immediately take the dresses away from children and return them to the place of purchase for a full refund. Kids II, Inc. Acquires Taggies, Rhino Toys. June 16, 2011 — Kids II, Inc., one of the world's fastest-growing infant and toddler products company, acquired two companies that will enhance increase its brand portfolio and product mix: Rhino Toys and Taggies. Rhino Toys includes the flagship product known as the O-Ball. Originally created as plush security blankets with satin ribbon loops, Taggies also offers blankets in new designs, plush toys, apparel, and accessories. Former Employee of Zhu Zhu Pets Maker Sentenced to 20 months in prison. June 16, 2011 — A former employee of a Clayton-based company pled guilty to embezzling $500,000 and was sentenced. Disney Signs Jumbo for Games. 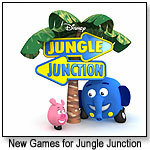 June 16, 2011 — Jumbo Games is to produce a range of games and puzzles based on Disney Junior’s preschool series, Jungle Junction. Discovery Partners With NKOK. June 16, 2011 — Discovery Communications inked an agreement with NKOK for the Discovery Kids radio-controlled and interactive products. The deal was brokered by Big Tent Entertainment, the North American licensing agent for the Discovery Kids brand. Disney To Open Baby Stores. June 16, 2011 — Disney announced that it will open its first Disney Baby store next year at the Americana at Brand in Glendale. Another store will open on the East Coast. Julius to Fly in Macy's Parade. June 16, 2011 — Saban Brands will extend the Julius and other characters from the Paul Frank brand to primetime beginning with a Christmas special. The family-friendly primetime event, which will be “in the spirit of ‘The Simpsons’ and with the heart of ‘Modern Family’,” is in pre-production and will debut on TV screens in December 2012. Next 'Wimpy Kid' Book to Get Six Million-Copy First Printing. June 16, 2011 — Abrams' Amulet Books imprint has announced a six million-copy first printing for the next book in Jeff Kinney's bestselling children's series, Diary of a Wimpy Kid. Book six, Diary of a Wimpy Kid: Cabin Fever, is scheduled for November 15 and the massive laydown, the publisher said, will be one of the most significant of 2011. Rowling Launches "Mysterious" Website. June 16, 2011 — Harry Potter fans have been reacting with excitement to a mysterious website launched by J K Rowling. Pottermore.com features a pink holding page with the description "coming soon" and Rowling’s signature underneath. JAKKS Pacific Recognized As Best Sports Entertainment Licensee Of The Year For UFC® Toy Line At The Licensing International Expo. June 16, 2011 — The International Licensing Industry Merchandisers’ Association (LIMA) awarded JAKKS Pacific, Inc. (NASDAQ: JAKK) with the Best Sports/Sports-Themed Entertainment Licensee of the Year Licensing Excellence Award for its line of Ultimate Fighting Championship® (UFC®) action figures and playsets at the annual LIMA Opening Night Awards Ceremony during the Licensing International Expo 2011 in Las Vegas. 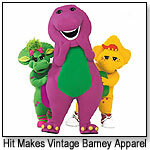 HIT Adds Barney Apparel. June 16, 2011 — HIT Entertainment signed several new licensees for a complete line of retro apparel and accessories targeted to nostalgic Barney fans. Scholastic Announces New 'Hunger Games' Pub Programs. June 16, 2011 — To capitalize on the holiday bookselling season—and building excitement for the release of the first Hunger Games film next year—Scholastic has announced new editions of and tie-ins to the first book in Suzanne Collins’s bestselling series, to be published later this year and in early 2012. Zodiak Signs Mr. Bean Ice Cream. June 16, 2011 — Zodiak Rights has signed a promotions deal with Omore, Engro Foods’ kids’ brand, in Pakistan. Omore will produce animated Mr Bean character branded ice-cream packs across three variants of its Frooze range of ice-lollies–Jelicks’, Dasher and Lick a Flavor, which will include in-pack premiums and an ultimate prize of a trip to London for a family of four. BBC to Publish 'Mike the Knight' Magazine. June 16, 2011 — HIT Entertainment appointed BBC Worldwide as the magazine publisher for the new pre-school series, "Mike the Knight." MGA Returns to Its Counsel: Skadden. June 15, 2011 — Faced with claims in federal court in New York by an artist claiming that his drawings are the basis for the wildly successful Bratz® dolls, MGA Entertainment is returning to its trial counsel, Skadden, Arps, Slate, Meagher & Flom LLP. Activision Getting Lalaloopsy with New Licensing Deal. June 15, 2011 — MGA Entertainment, the innovative toy company behind the highly successful line of Lalaloopsy collectible dolls, has granted Activision Publishing, the exclusive worldwide rights to develop, manufacture and distribute videogames based on the Lalaloopsy brand and characters. Toy bear, 'Winnie the Pooh', Turns 90-yrs-old. June 15, 2011 — The toy bear that inspired A.A. Milne's famous children fictional stories 'Winnie the Pooh' turns 90-years-old this month. VEGAS 2011: Toy Story 3 Scoops Best Licensed Program Award. June 15, 2011 — LIMA has presented its annual awards, wth the Disney Pixar sequel taking the overall honor. The third installment of Disney's film series, was also honored in the entertainment award category. Fox Consumer Products Restructures With New Appointments. June 15, 2011 — Elizabeth Bohannon has been appointed VP of global brand management of TV and Jonathan Linn as VP of global brand management of film for Twentieth Century Fox Consumer Products. In their respective roles, Bohannon and Linn will lead brand strategy for some of the biggest television and film properties in the Fox portfolio, including Diary of a Wimpy Kid (pictured), Alvin and the Chipmunks, Avatar, Ice Age and Rio. aDOORable Swing Bar Recalled by Sportime Due to Fall Hazard. June 15, 2011 — The following product safety recall was voluntarily conducted by the firm in cooperation with the CPSC: About 600 Abilitations aDOORable swing bars from Sporting King Co. Ltd., sold at Sportime in Georgia from January 2009 through March 2011 for about $60. A welded eye hook on the swing bar can break, posing a fall hazard. Consumers should stop using the recalled swing bars immediately and contact Sportime to receive a full refund for the swing bar and additional attachments sold with the swing bar. Target Expands Recall of Child Booster Seats Following Additional Reports of Falls. June 15, 2011 — The U.S. Consumer Product Safety Commission, in cooperation with the firm named below, today announced a voluntary recall of the following consumer product: About 375,000 Circo Child Booster Seats from Target, sold at Target stores nationwide from January 2005 through June 2009 for about $13. The booster seat’s restraint buckle can open unexpectedly, allowing a child to fall from the chair and be injured. Consumers should immediately stop using the recalled booster seats and return them to any Target store for a full refund. Shrinkage on the Rise, According to Preliminary National Retail Security Survey Findings. June 14, 2011 — Growth in retail crime and fraud is leaving retailers racing to stop the individuals responsible for stealing billions of dollars each year. Preliminary results of the latest National Retail Security Survey, released today at the National Retail Federation’s Loss Prevention Conference and EXPO, show that retail shrinkage increased to 1.58 percent of retail sales in 2010, up from 1.44 percent in 2009. Yu-Gi-Oh! Sets Guinness Record with 25.1 Billion+ Cards. June 14, 2011 — The game maker Konami announced on Tuesday that Guinness World Records has recognized Yu-Gi-Oh! as the best-selling trading card game to date with over 25,175,567,833 cards sold as of March 31, 2011. Nickelodeon gets educational with Team Umizoomi kits. June 14, 2011 — The network is launching Team Umizoomi Preschool Math Kits exclusively at Toys ‘R’ Us stores across the US beginning in July. The kits will provide a hands-on way for preschoolers to experience math with their parents and incorporate math into everyday life. Nickelodeon Announces JAKKS Pacific As Master Toy Licensee for Innovative Girls Brand: Winx Club. June 14, 2011 — Nickelodeon and JAKKS Pacific, Inc. announced a multi-territory master toy license agreement for JAKKS Pacific to manufacture, distribute and market a line of toys and other products based on the animated action and fantasy series, Winx Club. Spin Master and NASCAR Team Up to Deliver New Exciting Line of Toys. June 14, 2011 — NASCAR Team Properties and Spin Master Ltd. have joined forces to connect with, and help build, a new generation of fans for the sport. As the primary toy licensee, Spin Master's line of products will begin hitting store shelves in 2012. Toys 'R' Us Adds Moshi Monsters in U.S. June 14, 2011 — Mind Candy will carry the Moshi Monsters toy line exclusively at Toys ‘R’ Us in the U.S. Moshi Monsters will be available in Toys ‘R’ Us stores nationwide and online at Toysrus.com in late July. Discovery Taps Hasbro for Doki. June 14, 2011 — Discovery Communications announced that Hasbro will launch a new plush line in Latin America for iconic Discovery Kids channel personalities Doki, Mundi and friends in November. 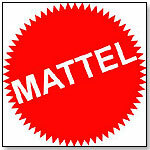 Mattel Retains its Top Ranking for New Trademarks in 2010. June 14, 2011 — http://www.findownersearch.com, the easy to use website for finding brands and their owners, announces that Mattel, for the third straight year, has maintained its number one ranking for applying for new USA trademarks. In 2010 Mattel applied for 625 new marks versus 577 in 2009- an 8.3% increase. VEGAS 2011: Mattel Sees Licensing As 'Key Tent Pole' In Its Future. June 14, 2011 — Mattel is showcasing it portfolio of evergreen brands and new properties at the Licensing International Expo, as it revealed that licensing is a key part of the firm's future. Mega Brands Makes New Play for Adult Collectors With Warcraft and StarCraft Toys. June 14, 2011 — Mega Brands is making another play at the adult toy collector with its plans to make construction toys based on the popular medieval Warcraft and StarCraft online games. Following its success with Microsoft's Halo video game, the Montreal-based toy maker has signed a licensing agreement with Blizzard Entertainment. Cabbage Patch Kids to Get Animated. June 14, 2011 — The Cabbage Patch Kids could be headed to the small screen again in a special that might be produced by Galen Walker, who is producing a live-action Teenage Mutant Ninja Turtles feature film for Paramount. Summertime Entertainment Signs Bandai Deal. June 14, 2011 — Summertime Entertainment, through its exclusive licensing agent Travis James, LLC, recently signed a master worldwide toy license agreement with Bandai America Incorporated for the upcoming 3D CGI animated musical feature, DOROTHY OF OZ. DOROTHY OF OZ is on track to bow in the Summer of 2012. Bandai’s toy line will feature an array of products that evoke the magic and wonder of OZ, including dolls, play sets, plush, role play, trading cards, and more, according to a press release. Crayola and Warner Bros. Consumer Products Ink Partnership. June 14, 2011 — Crayola, LLC and Warner Bros. Consumer Products have formed a licensing partnership bringing kids’ favorite Warner Bros. characters to Crayola’s popular line of art activities. The properties include Green Lantern, Looney Tunes and Scooby-Doo and will be featured on Crayola’s Giant Coloring Pages, Color Explosion and Mess-Free Color Wonder lines. Joan Ganz Cooney Center Release "Families Matter" Report. June 14, 2011 — Families Matter focuses on two complementary studies that document how families with young children are integrating digital media into the rhythm of daily life. Results from a survey of more than 800 parents of children ages 3 through 10 reveal how parents nationwide feel about raising children in a digital age. VEGAS 2011: Licensing Works picks up Hearts for Hearts Girls. June 14, 2011 — Licensing Works has been appointed as the global agent for the Hearts for Hearts Girls brand from Playmates Toys. ASTRA to Honor Industry Leaders at Marketplace & Academy. June 13, 2011 — ASTRA founding member and veteran specialty toy retailer Deb McCollister will be honored with a Lifetime Achievement Award at ASTRA’s Marketplace & Academy in Anaheim, the American Specialty Toy Retailing Association announced today. Other awardees will include the Wichita, Kansas toy store Imagine That Toys, which will receive the Retailer Excellence Award; The Orb Factory, which is this year’s Manufacturer Excellence Award winner; and Vanessa Fondren of Diverse Marketing, who will be recognized with the Sales Rep Excellence Award. The award ceremony will take place on Monday, June 20, 2011 at the Marriott Anaheim Hotel in Anaheim, California during ASTRA’s annual Awards Breakfast and Business Meeting. The event begins at 8 AM Pacific time. Toys R Us Q1 Net Loss Increases. June 13, 2011 — Toys R Us, Inc., a toy and juvenile products retailer, has reported a net loss attributable to the company of $67 million for the first quarter ended April 30, 2011, compared to a net loss attributable to the company of $55 million for the first quarter ended May 1, 2010. Toy Company Introduces Anthony Weiner Action Figure. June 13, 2011 — A toy company known for producing action figures of US political figures has started advertising its latest addition, the Anthony Weiner doll. Herobuilders.com is offering two versions of the doll modelled after the New York Democrat who shot to fame around the world last week after admitting to having sent a lewd photo of his crotch to a Seattle college student on Twitter. ASTRA to Honor Industry Leaders at Marketplace & Academy. June 13, 2011 — ASTRA founding member and veteran specialty toy retailer Deb McCollister will be honored with a Lifetime Achievement Award at ASTRA’s Marketplace & Academy in Anaheim, the American Specialty Toy Retailing Association announced today. Other awardees will include the Wichita, Kansas toy store Imagine That Toys, which will receive the Retailer Excellence Award; The Orb Factory, which is this year’s Manufacturer Excellence Award winner; and Vanessa Fondren of Diverse Marketing, who will be recognized with the Sales Rep Excellence Award, according to a press release. Excite USA Recalls Toy Helicopters Due to Laceration Hazard; Sold Exclusively at Rite Aid Stores. June 13, 2011 — The U.S. Consumer Product Safety Commission, in cooperation with the firm named below, today announced a voluntary recall of the following consumer product: About 24,000 Military Copters by Excite USA, sold exclusively at Rite Aid Corporation stores nationwide from January 2011 through May 2011 for about $7. The plastic blades of the helicopter can detach during operation, posing a laceration hazard. Consumers should immediately take the recalled helicopters away from children and return the product to any Rite Aid store for a full refund. Moshi Monsters Scare Up Global Deals. June 13, 2011 — Moshi Monsters, the global hit from Mind Candy, has reached a milestone of 50 million users and with it has announced several licensing partners worldwide. In North America, Mind Candy recently opened a New York-based office and appointed Eric Karp to develop the licensing program in the territory. Tom Hanks' Playtone Productions Announces New Projects. June 13, 2011 — Tom Hanks’ Playtone Productions is set to produce an open-ended series, American Gods, for HBO, based on Neil Gaiman’s award-winning novel, while the company’s next project, Major Matt Mason, is in talks with Robert Zemeckis to direct in 3D, Playtone partner Gary Goetzman told The Hollywood Reporter. Cut Back on Excess Packaging in Children's Toys, Government Urges Manufacturers (UK). June 13, 2011 — Excess packaging used with children's toys could be cut back under new government plans. Environment Secretary Caroline Spelman will announce proposals to extend a voluntary code on cutting packaging on food and toys after an official review of waste policy. Nerd Corps Signs Disney Deal. June 13, 2011 — Nerds Corps signed a deal to broadcast its original comedy action series "Slugterrainea" on Disney XD channels in the U.S. and globally. Kids Licensing Highlights Yu-Gi-Oh!. June 13, 2011 — 4Kids Licensing will showcase its Yu-Gi-Oh! Brand at Licensing International Expo, in addition to its properties Max Adventures and Dinosaur King. Mattel Inks Masters of the Universe Deals. June 13, 2011 — Mattel and Classic Media have launched a consumer products program to celebrate the 30th anniversary of Masters of the Universe franchise. The program includes apparel from Changes, costumes from Disguise and a special 30th anniversary edition DVD box set from Mill Creek Entertainment. Mattel Reveals Thomas & Friends Campaign. June 13, 2011 — Mattel has unveiled a break-frame 360 degree campaign to promote Fisher-Price and the leading pre-school property, Thomas and Friends. Universal Pictures and Cepia LLC Join Forces for First-Ever ZhuZhu Pets® Global Marketing and Distribution DVD and TV Alliance. June 10, 2011 — Cepia LLC, the maker of ZhuZhu Pets®, today announced a worldwide television rights and home entertainment arrangement with Universal Pictures to release two feature-length, animated films, "Quest for Zhu™" and "Power of Zhu,™" to debut exclusively on DVD in 2011 and 2012, respectively. Paper Firm Welcomes Mattel's Deforestation Inquiry. June 10, 2011 — Asia Pulp and Paper (APP) said that it welcomed an investigation by US toy maker Mattel into allegations that it destroys Indonesian forests to source its products. Toy Industry Foundation Launches “Play Connects” Grant Program. June 10, 2011 — The Toy Industry Foundation (TIF) and the Toy Industry Association (TIA) announced today the launch of the Foundation’s newest grant program, Play Connects, which will provide up to three $10,000 grants to local charities nominated by members of the Toy Industry Association (TIA). Play Connects funding will be awarded annually; only 501 c (3) organizations nominated by TIA members in good standing are eligible. E3 2011: Nintendo's new Wii U set for 2012. June 10, 2011 — Nintendo got the next wave of console wars started today with the introduction of the next entry to its arsenal, the Wii U, at the company's E3 presentation. The new console, with an iPad-like controller, will be available next year, as the company had said in April. Costa Rican Officials Say 13 Children Hospitalized After Swallowing Lead Ball in Chip Bags. June 10, 2011 — Costa Rican health officials say 13 children had to be hospitalized after swallowing a lead ball that was part of a toy that a food company included inside bags of corn chips. The children thought it was candy. Disney expects Cars merchandise to top Toy Story. June 10, 2011 — "Cars 2" debuts in U.S. theaters June 24. Merchandise began hitting stores globally in mid-May and is on track to beat retail sales from mega-hit "Toy Story 3," said Andy Mooney, head of Disney's consumer products division. Sanrio, Inc. Announces Licensing Agreement With Fiesta. June 10, 2011 — Sanrio, Inc. has signed a new licensing agreement with Fiesta, to produce a collection of plush toys for the prize redemption market, featuring Hello Kitty® and other iconic Sanrio characters. The agreement is effective immediately, according to a press release. CNE Inks Zoobles Book Deal. June 10, 2011 — Cartoon Network Enterprises, the exclusive global licensing and merchandising agent for Spin Master, partnered with Penguin Group for a publishing program featuring Spin Master’s Zoobles toy line. Book will debut next spring. Masters of the Universe Gears Up for 30th Anniversary Celebration. June 10, 2011 — Classic Media is partnering with Mattel to roll out a new consumer-products program for Masters of the Universe to celebrate the brand's 30th anniversary in 2012. Lisa Marks Signs Sassy Brand. June 10, 2011 — Lisa Marks Associates will debut the first ever licensing program for infant development brand Sassy next week at Licensing International Expo in Las Vegas. Henson Signs for Multiple Properties. June 10, 2011 — The Jim Henson Company finalized deals with new international licensees for a slate of properties, including Dinosaur Train, Sid the Science Kid, Fraggle Rock, Labyrinth and Skatelab, and new series Pajanimals. Silverlit Toys Announces Upcoming “Rollout” of Head Shotz Battling RC Toys. June 10, 2011 — Silverlit®, a worldwide leader in the manufacturing of hi-tech innovative toys, announced today the upcoming launch of Head Shotz, a line of customizable, transforming R/C battle ball toys, designed to compete in head-to-head combat. Organized Criminals Becoming More Violent, Endangering Safety Of Retail Associates, According To NRF Survey. June 10, 2011 — Organized retail crime isn’t only costly for businesses, it’s dangerous, and the problem extends far beyond stores, according to NRF’s seventh annual Organized Retail Crime survey. Of the 129 retail companies surveyed this year, nearly all (94.5%) have been the victim of organized retail crime in the past 12 months, an increase over last year and the most in the survey’s history. Mattel Responds to Greenpeace Allegations. June 9, 2011 — Mattel has released a statement on their corporate website in response to Greenpeace's recent campaign against the company for allegedly sourcing packaging materials from a company that contributes to deforestation in Indonesia. You can read the full statement here. '9' Helmer Shane Acker Boards Feature Based On The Thomas The Tank Engine Toys. June 9, 2011 — HIT Entertainment, rights holder to the Thomas the Tank Engine kiddie juggernaut, is moving forward with its first live action theatrical film. Shane Acker, who directed the 2009 animated film 9, will direct a film set in Sodor, the island of talking trains., where Thomas is among a litany of characters. Disney Announces Phineas and Ferb Deals. June 9, 2011 — Disney announced several upcoming deals for the Phineas and Ferb property. Along with a new movie, several books, a video game, and a live touring stage show, Disney Consumer Products will develop new items for the property, including action figures, apparel, accessories, and more. Safari Ltd. Announces New Officers. June 9, 2011 — Alexandre Pariente, who previously was Vice President of Sales at Safari Ltd., is now President. Ramona Pariente, formerly President, is now C.E.O., according to a press release. ASTRA Launches New Website. June 9, 2011 — The American Specialty Toy Retailing Association (ASTRA) announced in a today the launch of their new website. New features on the site (which retains the old web address) include a discussion board, a job posting board, and improvements to previous features, according to a press release. HarperCollins U.K. Wins Transformers. June 9, 2011 — HarperCollins U.K. inked an agreement with Hasbro for film tie-in publishing of Transformers: Dark of the Moon. Hot Wheels Adds Metal Mulisha. June 9, 2011 — Feld Motor Sports' Advance Auto Parts Monster Jam has collaborated with Metal Mulisha founder Brian Deegan to create the first-ever line of Hot Wheels Monster Jam Metal Mulisha die-cast monster truck toys. Konami Plans Karaoke Revolution Glee 3. June 9, 2011 — Konami Digital Entertainment and Twentieth Century Fox Consumer Products will release Karaoke Revolution Glee: Volume 3 this fall. Ceaco Secures Lalaloopsy Puzzle License. June 9, 2011 — Ceaco, a jigsaw puzzle and game manufacturer, is launching a line of CeacoKIDS puzzles featuring MGA Entertainment’s popular Lalaloopsy characters. The puzzles will be available at many top retailers nationwide beginning in July 2011, according to a press release. Bigjigs Toys Comes to US. June 9, 2011 — English wooden toy company Bigjigs will enter the US specialty toy market this summer with two collection, Bigjigs Rail and Bigjigs Heritage Playsets, according to a press release. Greenpeace Stages Protest at Mattel Office Over Barbie Packaging. June 8, 2011 — Environmentalists have launched a global campaign against Mattel Inc., the world's largest toy company, as part of a decade-long effort to force multinational corporations to purge their operations of any links to rain forest destruction. MGA Recalls Item # 504788 BRATZ MAKEUP Design Sketch Book Because of Possible Health Risk. June 8, 2011 — MGA Entertainment of Van Nuys, CA is recalling 6,200 units of the Bratz Makeup Design Sketch Book. This product has the potential to be contaminated with Staphylococcus warneri and Staphylococcus intermedius. MGA is recalling products produced between November 5, 2010 and February 25, 2011. The Makeup Design Sketch book was distributed nationwide and sold through retail stores and e-commerce web sites. Consumers should discontinue use of this product. For information on how to obtain a refund for your purchase, phone MGA Customer Service at 1 800 222-4685 Monday-Saturday, 8 AM-6 PM CST. To date there have been no reports of illness or injury associated with this product. Dr. Toy Announces Best Vacation Children's Products for Summer 2011. June 8, 2011 — The list of Dr. Toy's Best Vacation Children's Products for Summer 2011 is now available online. The information is designed to assist children to play and learn at home and while on vacation, according to a press release. Max & Ruby Jump for Chick-fil-A. June 8, 2011 — Nelvana Enterprises announces that its Max & Ruby property will be featured in a kid’s meal premium promotion at Chick-fil-A restaurants in the U.S. this summer. Sony Announces PlayStation Vita. June 8, 2011 — Yesterday at the 2011 E3 Sony press conference, Sony revealed the PlayStation Vita, a Wi-Fi enabled handheld gaming device. There will also be a 3G/Wi-Fi model available. The device features a 5 in OLED screen and utilizes a touch screen and touch pads on the back. The device will be sold for $249 starting in the end of 2011, according to the PlayStation blog. Stone American Licensing Name Agent for Scientific American. June 8, 2011 — Stone America Licensing has been named exclusive licensing agent by Scientific American. Stone America is looking to offer manufacturers and retailers the rights to license apparel, toys & games, electronics, and more, according to a press release. Super Hero and Super Villain Squinkies Come to Retail. June 8, 2011 — Marvel Entertainment, LLC has entered into a licensing agreement with Blip Toys, the innovative toy company behind the hugely successful line of Squinkies collectible figures. As part of the multiyear deal, Blip Toys has created an all-new collection of Squinkies for boys inspired by Marvel’s most popular Super Heroes and Super Villains. Zodiak Kids Secures Raft Of Little Princess Licensing Deals. June 8, 2011 — Zodiak Kids, Zodiak Media Group’s children’s production and distribution arm, has concluded a number of licensing deals for the hit pre-school property LITTLE PRINCESS™. Aurora World UK has acquired the rights to develop a Little Princess plush range for launch in early 2012, while this summer, Neon Play will launch the first Little Princess app for iPad, iPhone and Android platforms. Zodiak Kids has also renewed their compilation magazine publishing deal with Kennedy Publishing who will continue to feature dedicated Little Princess pages within their Pink, Cute, Busy Time & Get Busy titles. Scholastic Celebrates With New Deals. June 7, 2011 — Several of Scholastic's most iconic brands have notable anniversaries coming up this year and next. Scholastic has inked new licensing deals for the Clifford the Big Red Dog (50yrs), I Spy (20yrs), and The Magic School Bus (25yrs) brands in conjunction with these anniversaries, according to a press release. LAPD Seeks Tighter Regulations on Toy Guns. June 7, 2011 — Los Angeles Police Chief Charlie Beck is proposing that the city require BB-gun replicas of actual firearms to be brightly colored so that police officers don't mistake them for real weapons. TK Brand Group Signs Several Deals. June 7, 2011 — TK Brand Group, a licensing agency based out of New York, has signed several new deals for its clients. New deals include licensee Logotel with Sesame Workshop for Sesame Street, The Topps Company for Garbage Pail Kids, and Paramount for Major League. Sqwishland has appointed Funtastic Limited Confectionery Division to create a line of Sqwishland sweets for Australia and New Zealand. EKSuccess Brands Recalls American Girl Crafts Jewelry Kit Due to Violation of Lead Paint Standard. June 7, 2011 — The U.S. Consumer Product Safety Commission, in cooperation with the firm named below, today announced a voluntary recall of the following consumer product: About 75,000 American Girl Crafts™ Pearly Beads & Ribbon Bracelets kit from EKSuccess Brands, sold at Michaels Stores and other retailers nationwide from September 2009 through June 2011 for about $8. The surface coating on some of the beads contains excessive levels of lead, which is prohibited under federal law. Consumers should immediately take the recalled kits and any finished bracelets made from the kits away from children and contact the company for a full refund. Sassy Partners With Carter's to Introduce Fun Developmental Toys With Purpose to the Carter's Brand. June 7, 2011 — Sassy and Carter's have partnered to introduce innovative, developmental toys bringing purpose and fun to a Carter's branded toy line. The partnership marks Carter's initial foray into developmental activity toys. Additionally, Sassy will be creating giftable plush toys and coordinates that match back to the endearing characters and color pallets found on Carter's, Just One You, Child of Mine and Precious Firsts clothing lines. Lights, Camera, Diecast. June 7, 2011— NBC Universal Studios and CBS Broadcasting are two of the most influential American television networks of our current generation, having powerful parts in the evolution of media and entertainment. GreenLight is proud to announce that they have obtained select licensing rights from both production studios to produce official merchandise and replicate cars from famous movies and tv shows. Kid Brands, Inc. Names Dean Robinson as President of Its Sassy Subsidiary. June 7, 2011 — Kid Brands, Inc. (NYSE: KID) announced that Dean F. Robinson has been appointed President of Sassy, Inc., which designs, markets and distributes infant developmental toys, and feeding, bath, and baby care products. Joester Loria to Rep Annoying Orange. June 6, 2011 — The Joester Loria Group was named exclusive licensing agency for “The Annoying Orange,” the No. 1 web series, by The Collective. HTA Calls on House Energy and Commerce Committee to Support Reform of CPSIA. June 6, 2011 — The Handmade Toy Alliance (HTA) representing small batch manufacturers and specialty toy retailers, today called on the House Energy and Commerce Committee to support H.R. 1939 (Enhancing CPSC Authority and Discretion Act of 2011, ECADA) during House Energy and Commerce Committee markup. ECADA addresses the unintended consequences of the Consumer Product Safety Improvement Act (CPSIA) – a law that threatens to destroy the small batch children’s product manufacturing industry and specialty toy shops in the United States. Majesco Entertainment Accelerates Its Online Portfolio. June 6, 2011 — Majesco Entertainment Company (NASDAQ: COOL), a leading publisher of video games for the mass market, announced today that it is making several key acquisitions from Quick Hit, Inc., underscoring the commitment to its social games business. Specifically, Majesco acquired certain key operating assets as well as the Quick Hit development team to execute on its social games strategy. Orrick Moves to Withdraw from Bratz Doll Case Over Unpaid Fees. June 6, 2011 — Orrick, Herrington & Sutcliffe, which helped win an $88.5 million jury verdict for MGA Entertainment in a dispute over the rights to the highly profitable Bratz doll line, has asked for permission to fire its client in a related dispute on the ground that the company owes more than $1.2 million in attorney fees. Mega Brands Extends Toy Making Contract With Microsoft. June 6, 2011 — Canadian toy maker Mega Brands Inc said it has extended a multi-year agreement with Microsoft Game Studios to make toys based on popular computer game Halo. British Retailer Tesco Reveals Its Top-10 Christmas Toys. June 6, 2011 — Tesco has revealed its list of the Top-10 must-have toys for Christmas 2011. Mattel's Fijit friends robot topped the list, with other mass market items from Hasbro and LEGO making the list as well. Toy Association of Southern California Elects New President. June 6, 2011 — On Friday, the Toy Association of Southern California elected Peter Wachtel of KID Toyology to be the organization's new President. Wachtel is replacing Leeton Lee, who served as President for the past 12 years. AGP Inks Publishing Deals in Europe. June 6, 2011 — American Greetings Properties and Copyright Promotions Licensing group announced several new licensing deals for Strawberry Shortcake with a variety of publishing products including magazines, activity, story and novelty books. The Disney Store Launches Fragrance. June 6, 2011 — The Disney Store has launched its new fragrance collection, including perfumes, home scents, candles, and more. The new products will be available beginning this month. Warner Bros. Makes Watches. June 6, 2011 — Warner Bros. Consumer Products has partnered with Accutime Watch to introduce premium watch designs inspired by legendary characters from the DC Comics Universe and Looney Tunes. The watches will hit stores in October. Paramount to Publish Star Trek Game. June 6, 2011 — Paramount Digital Entertainment confirmed that it will publish a Star Trek game under a license from CBS Consumer Products for Xbox 360, PlayStation3 and Windows PC next year. HIT Entertainment Launches Thomas App. June 3, 2011 — HIT Entertainment and Callaway Digital Arts launched Thomas & Friends: Hero of the Rails, an app for iPad, iPhone and iPod touch available in Apple’s app store. The app is already No. 1 in the iTunes Store in the Books Category. More Toys Means More Exercise. June 3, 2011 — A study by the American College of Sports Medicine has shown that increasing the number of active toys a child has to play with can motivate them to remain active longer. In the study, 36 children ages 8-12 were separated into different groups based on the number of toys provided. The groups with the most toys (3-5) played 95% more during their hour of free play than the groups with just one toy. By monitoring heart rates while children played, the researchers also determined that a wider variety of active toys increased girls' intensity of play even more than boys. Skechers Signs Sporting Goods Deal. June 3, 2011 — Skechers USA signed a licensing agreement with Street Flyers to produce sporting goods and safety gear collections for children and young adults. Both collections are planned to launch in toy and mass market retailers throughout the U.S. and Canada next spring. Wappy Dog to be Released for Holidays. June 2, 2011 — Activision Publishing, Inc. has announced that their virtual pet, Wappy Dog, will be available beginning this holiday season. The robotic dog interacts with the game player through the Nintendo DS, reacting both physically and on screen. Suzy's Zoo Celebrates Book Sales. June 2, 2011 — Suzy’s Zoo sold more than 750,000 books in the last quarter of 2010, with total sales of nearly 7 million. Toys 'R' Us Joins Cancer Fight. June 2, 2011 — Toys 'R' Us launched an eight-week, in-store and online fundraising and awareness campaign benefiting Alex’s Lemonade Stand Foundation, a non-profit organization dedicated to finding treatments for childhood cancer, that runs through July 31. Parents' Choice Announces Spring '11 Award Winners. June 2, 2011 — Parents' Choice has announced their Spring 2011 toy, game, and puzzle award winners. A full list of recipients, organized by category, can be seen here. RI approves tax break for Hasbro expansion. June 2, 2011 — Toy manufacturer Hasbro will receive up to $1.628 million in tax breaks from the state of Rhode Island thanks to recent "Project Status" approval from the state's Economic Development Corporation. Musical Shaker Instrument Recalled by Woodstock Percussion Due to Laceration and Choking Hazard. June 2, 2011 — The U.S. Consumer Product Safety Commission and Health Canada, in cooperation with the firm named below, today announced a voluntary recall of the following consumer product: About 9,400 in the U.S. and 700 in Canada Gripper Shaker musical instruments from Woodstock Percussion Inc., sold by mail-order catalogs, websites and retail stores nationwide between August 2010 and March 2011 for about $5. The handle can detach from the shaker, exposing a rough edge and posing a laceration hazard. The detached handle also exposes small steel pellets and a plastic plug which pose choking hazards. Consumers should stop using the product immediately and contact Woodstock Percussion Inc. to receive a $7 refund. Kahn Enterprises Recalls Beeni Baby Hats Due to Asphyxiation Hazard. June 2, 2011 — The following product safety recall was voluntarily conducted by the firm in cooperation with the CPSC: About 35 Beeni Baby Hats from Kahn Enterprises LLC, sold on Beeni Baby’s website www.beeni.net from January 2009 through May 2011 for about $25. A baby can spit up during use, posing an asphyxiation hazard. Consumers should immediately stop using the hats and contact Kahn Enterprises to receive a full refund. Dr. Seuss Supports World Oceans Day. June 1, 2011 — Dr. Seuss Enterprises, Random House Children's Books, The Ocean Project and the Associations of Zoos and Aquariums have partnered to celebrate World Oceans Day on June 8th. VTech Announces Full Year Results. June 1, 2011 — VTech has reported $1.71 billion in revenue for the last financial year, ending March 31, 2011, an increase of 11.8% over last year. They reported net profits of $333.1 million, and a .3% increase in revenue in the US. Spin Master Launches Redakai. June 1, 2011 — Spin Master Ltd. will launch action card game Redakai on June 4th at specialty hobby and gaming stores, rolling out to mass market stores in August, according to the Action Figure Insider. Tomy Hopes RC2 Will Boost Overseas Sales. June 1, 2011 — Tomy Co. is relying on its recent acquisition of US toymaker RC2 Corp. to help generate half of worldwide sales in foreign markets by the end of March 2015, according to Nikkei.com. NCirlce Acquires Two New Properties. June 1, 2011 — DVD distributor NCirlcle has acquired distribution rights for "The Gruffalo," and Academy Award-nominated short animated film based on a children's book, and "The Fairies," an Australian TV series. Super Rad Announces Plastic Stock Exchange. June 1, 2011 — Super Rad has announced that it is developing an online toy collector selling and auctioning site. Individuals, and toy companies selling off their current stock, will be able to participate. They plan on catering the site specifically to toy enthusiasts and collectors. K’NEX® CEO Michael Araten Named One of SmartCEO Magazine’s Smart100. June 1, 2011 — Michael Araten, President and CEO of K’NEX Brands, recently accepted an invitation to join SmartCEO Magazine’s Smart100, a group of the Philadelphia region’s top executives. The 100 CEOs were selected by an independent committee based on their demonstration of leadership, strategic vision and character and will meet throughout the year for networking events. The Toy Collector Launches Online Marketplace. June 1, 2011 — The Toy Collector, a Wikipedia-style toy collector website, is launching their online marketplace on June 29th. The site focuses primarily on die-cast collectible cars, and is hoping to find a market in the UK, where the site is based, and the US, where toy collectors abound. Nomination Period for Toy Industry Hall of Fame Now Open. June 1, 2011 — Toy Industry Association (TIA) members and toy industry stakeholders are invited to submit nominations of deserving candidates for induction into the Toy Industry Hall of Fame in February 2012. The nomination period will extend from June 1 through June 30, 2011. Fisher-Price Tie Up for Peppa Pig Toy Line. May 31, 2011 — Entertainment One Ltd said it was working with Fisher-Price, part of the world's largest toy maker Mattel Inc , to develop a toy line in the United States based on its popular pre-school TV show 'Peppa Pig'. Bicycle Helmets Recalled by Bell Sports Due to Head Injury Hazard. May 31, 2011 — The U.S. Consumer Product Safety Commission and Health Canada, in cooperation with the firm named below, today announced a voluntary recall of the following consumer product: About 31,100 in the United States, and about 2,500 in Canada, Bell Exodus full-face bicycle helmets from Bell Sports, sold at Walmart stores nationwide and Amazon.com between August 2009 and March 2011 for between $50 and $60. The firm has received one report of a buckle failing during an accident, resulting in an injury that required stitches below the wearer's eye. Consumers should stop using the helmets immediately and contact Bell Sports for a replacement or refund. Model Helicopters Recalled by Horizon Hobby Due to Impact and Laceration Hazards. May 31, 2011 — The U.S. Consumer Product Safety Commission and Health Canada, in cooperation with the firm named below, today announced a voluntary recall of the following consumer product: About 16,600 in the U.S., and about 1,300 in Canada Blade mCP X Bind-N Fly and Ready to Fly Remote Control Model Helicopters and replacement Blade mCP X Main Blade Grips with Bearings from Horizon Hobby, Inc.. The 'copters were sold at retailers nationwide during March 2011 for $180 to $220 for the model helicopters and $10 for the replacement part. The main blade grips and main rotor blades can release from the main rotor head, posing an impact and laceration hazard. Consumers should contact Horizon Hobby for free replacement of main rotor grips and do-it-yourself instructions. Tests Discover Heavy Metals Polluting Toys. May 31, 2011 — In China, toy testing of 242 random products picked at random from markets in several cities found that approximately 8.3% of the toys did not meet national mandatory quality requirements. The General Administration of Quality Supervision, Inspection and Quarantine also tested children's shoes, of which 17.5 percent sampled had safety problems, and bicycles, of which 20 percent had safety issues. As June 1st, Children's Day, approaches, many caretakers are worried about the contents of the toys they are giving to their loved ones. The current national standards for toy safety have not been revised since 2003, according to China Daily/Asia News Network. Mr Men and Little Miss Debut in Brazil. May 31, 2011 — Chorion secured new licensing and retail deals for Mr. Men and Little Miss in Brazil through its agent Exim Licensing. Team Hot Wheels™ Sets New World Record With 332 ft. Distance Jump at Centennial Indianapolis 500. May 29, 2011 — Today as part of "IZOD Presents Hot Wheels Fearless at the 500™," Team Hot Wheels™ Yellow Driver Tanner Foust successfully landed a ramp-to-ramp distance jump of 332 feet. Foust, a three-time X Games gold medalist and professional stunt driver smashed the previous world record by an impressive 31 feet at the 100th anniversary of the Indianapolis 500.